Here is an easy neckerchief slide. It can be made out of milk jug lids or small wooden discs bought at the craft store and painted purple. 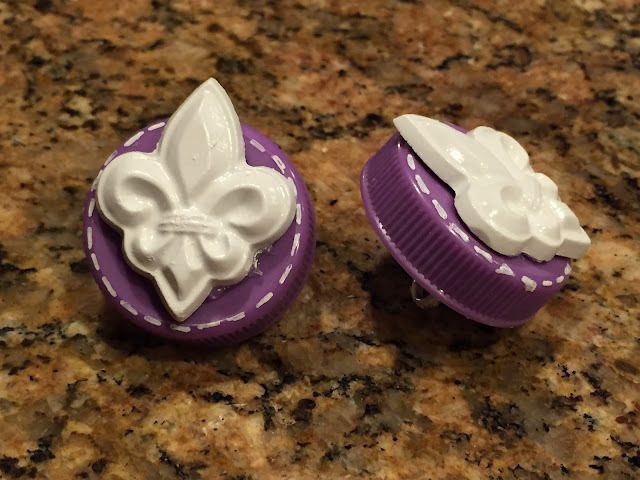 I bought the Fleur-de-lis Candy Mold at Hobby Lobby and used plaster of paris in it. I let them dry, then painted them white, drew dotted lines with white marker around the milk jug lids and glued the fleur-de-lis on the milk jug lids and some more of them on the wooden discs. Then I filled the lid with plaster of paris and put in a metal ring and let it dry, and hot glued a small piece of PVC onto the back of the wooden discs. What is that purple patch on your shirt all about? The US flag tells someone what country you are from. The Council Strip tells someone what area/council you belong to. The Pack numbers tells someone which pack you belong to. The WEBELOS neckerchief tells someone you are in the WEBELOS den. The purple World Crest patch is worn by scouts all over the world. It is fun to talk to the boys about our uniforms and what someone can know about us just by looking at our scout uniform. You will see some light bulbs go on during your discussion! The World Crest is a Scout emblem that has been worn by an estimated 250 million Scouts since the Scouting movement was founded in 1919. It is still worn by 28 million Scouts in 216 countries and territories and is one of the world's best-known symbols. Scouts and members of the public often ask how the emblem originated. Lord Baden-Powell himself gave the answer: "Our badge we took from the 'North Point' used on maps for orienteering." Lady Baden-Powell said later, "It shows the true way to go." The emblem's symbolism helps to remind Scouts to be as true and reliable as a compass in keeping to their Scouting ideals and showing others the way. The crest is designed with a center motif encircled by a rope tied with a reef or square knot, which symbolizes the unity and brotherhood of the movement throughout the world. Even as one cannot undo a reef knot no matter how hard one pulls on it, so, as it expands, the movement remains united. The three tips of the center fleur-de-lis represent the three points of the Scout Promise. In some countries, the two decorative five-pointed stars stand for truth and knowledge. The crest is white on a royal purple background. These colors are symbolic as well. In heraldry, white represents purity and royal purple denotes leadership and help given to other people. The World Crest is an emblem of the World Organization of the Scout Movement and is authorized for wear on the uniform of all member associations as a symbol of membership in a world brotherhood. It is authorized by the Boy Scouts of America to be worn by all adult and youth members as a permanent patch centered horizontally over the left pocket and vertically between the left shoulder seam and the top of the pocket. The BSA donates a small portion of the proceeds from each patch sold to the World Scout Foundation to assist with the development of Scouting's emerging nations. Can LDS Cub Scouts go Camping?